Bertha Lutz at the San Francisco Conference, in 1945. UN Photo/Rosenberg. UNITED NATIONS, Sep 15 2016 (IPS) - It was little-known Brazilian delegate Bertha Lutz who led a band of female delegates responsible for inscribing the equal rights of women and men in the UN Charter at the San Francisco Conference on International Organisation in 1945. “The mantle is falling off the shoulders of the Anglo-Saxons and…we [Latin American Women] shall have to do the next stage of battle for women,” Lutz wrote in her memoir, recalling the conference. Researchers Elise Luhr Dietrichson and Fatima Sator of London’s School of Oriental and African Studies (SOAS) presented this forgotten history at a recent news conference at the United Nations, wishing to publicise the true history of women’s rights in the UN Charter. “It’s not only about representing historical facts. It’s political; it’s about how history is presented,” Luhr Dietrichson told IPS. There is, she says, little recognition of the role of nations in the global south in establishing “global norms”. “The mantle is falling off the shoulders of the Anglo-Saxons and we Latin American Women shall have to do the next stage of battle for women,” -- Bertha Lutz. Contrary to popular assumption, women’s rights in the charter were not achieved by Eleanor Roosevelt – this was not an American, nor a British, stipulation. It was, instead, a Latin American insistence: Lutz along with Minerva Bernadino from the Dominican Republic, and the Uruguayan Senator Isabel P. de Vidal, who insisted on the specific mention of “the equal rights of men and women” at the charter’s opening. Lutz and those behind her were acting at a time when only 30 of the 50 countries represented at the conference had national voting rights for women. Thanks to their spirited determination, alongside support from participants in Mexico, Venezuela and Australia, she was successful in her demand to have women explicitly mentioned in Article 8, which states that men and women can participate equally in the UN system. Australian representative Jessie Street “was very vocal, saying: ‘you need to state women specifically in the charter, or else they won’t have the same rights as men; you see this time and time again…’” explains Luhr Dietrichson. Among others in their number, Street’s and Lutz’s feminism enabled them to foresee that the rights of women would be sidelined if they were not explicitly accounted for – that it was not enough simply to enshrine the “rights of man,” as had been argued. Lutz’ arguments were met with opposition from British and American representatives. 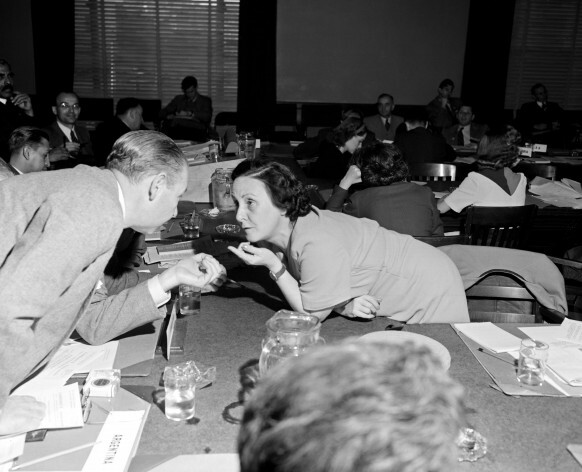 Recalling the 1945 conference that brought the United Nations into being, Lutz described the American delegate Virginia Gildersleeve saying “she hoped I was not going to ask for anything for women in the charter since that would be a very vulgar thing to do,” trying to pre-empt any action in the name of women. Gildersleeve rewrote a draft of the charter, omitting the specific mention of women. In the end, however, alongside Lutz and Bernadino, Gildersleeve and Wu Yi-fang, the Chinese delegate, did sign it as a whole. They were the only four women out of 850 total delegates to sign the seminal document. A British representative, Labour Parliamentary secretary Ellen Wilkinson, assured Lutz that equality had already been achieved, saying that she had achieved a position on the King’s Privy Council. Lutz disagreed: “’I’m afraid not,’ I had to tell her, ‘it only means that you have arrived”. Such a discourse mirrors contemporary debate born out of Cheryl Sandberg’s book, Lean In, which celebrates individuals’ ambition and success, rather than taking a more global perspective on the systemic injustices women face. “They were actively engaged in not fighting for gender equality… This is something that goes against everything we have been taught: that the West has been teaching us about feminism. But on this matter, on the charter, they were more than opposed,” Sator, who is from Algeria, told IPS. Though Roosevelt was not involved in the creation of the charter, she became head of the UN Commission on Human Rights in 1946 and was instrumental in drafting the Universal Declaration on Human Rights. Yet Western countries – including the United States, the United Kingdom and France – later worked to undermine that same declaration in the early 1950s. As with the history of women’s rights in the UN charter, the role of countries of the global south in creating and protecting the human rights charter has been underestimated. Speaking at the conference, Brazilian Ambassador Antonio Patriota conveyed that Lutz and this story are not at all well known even in Brazil, and welcomed this effort to share the history more widely. At the conference, Luhr Dietrichson emphasised that a sense of “ownership” can lend legitimacy, enabling the engagement and involvement of future generations. This research is part of a wider effort to “rediscover the radical origins of the United Nations,” Professor Dan Plesch, Director at the Centre for International Studies and Diplomacy at SOAS, told IPS. It forms part of a wider academic project, UN History for the Future, which seeks to re-contextualise the UN, created not as “some liberal accessory” but “out of hard, realistic political necessity,” Plesch argues. At a time when there have been widespread calls not only for a woman to finally lead the United Nations, but for a self-described feminist to be seen in the role, Sator and Luhr Dietrichson’s research is a reminder that we still have a long way to go in fulfilling the charter’s vision of equality.